Yeah, this is extremely Dated, but I'm throwing it out Thar' upon the "Intrawoods" anyways, since I wasn't able to watch; err listen to the Pocono 500 IndyCar race Wayback on August 19th. Ironically, I spent the day first waiting 'N waiting for Claudio', my anointed Moving Truck Driver to be ready to depart from our Tacoma lair', while Tacoma Bureau Chief Mary Ellen & I, along with Pixie-the-Wonderdog; WUF-WUF! Ridin' Shotgun upon thou lap in the "chase Vehicle," which Claudio enjoys calling his "Grocery Getter!" His Dodge Caravan loaded to the Gills with my many framed Auto Racing Artwork pieces filling up the rear cabin headed South for the day's journey. As we finally departed from Tacoma around 1:30PM, (Pacific) after filling the vehicle's petrol tanks, before arriving in Florence, Oregon approximately at 9PM that evening. Alas, in the midst of All of this moving chaos, I didn't get around to checking to see who'd won the Pocono IndyCar race until the following Thursday morning Aug 23, (Claire's second Chemotherapy treatment) via my NFB Newsline for The Blind telephone service. Naturally, I was Shocked when listening to the Indianapolis Star's Sports section regarding Robert Wickens Horrendous Accident! For which it only seems like a miracle he survived this wicked incident! As my shock subsided, I initially thought of 'Ol Dario REO Speedwagon Franchitti, who wisely retired from IndyCar racing after his Mega' Fence Climbing Shunt at Houston many years ago. Yet since I wasn't able to watch; err listen to this year's Pocono 500, which it's many hours Red Flag Delay to fix the Catch Fencing, Clean-up Debris, etc. conjures up thoughts of sitting thru that abombanle 2011 Las Vegas "Who's your Daddy?" World Finale Sweepstakes, for which Dannyboy Spike' Wheldon un-needlessly lost his life. Hence, I relied upon my two primary IndyCar bloggers for their insights to the Pocono 500 fiasco, since as I've already mentioned. I managed to stay in a virtual News Blackout until the following Thursday morning. First I went with Jeff Iannucci's One Lap Down, simply since it was the easier to access, while Geo. Phillips of Oilpressure Fame's post was slightly buried in the Older Posts link. As typical, both "Veteran" IndyCar bloggers make Thar usual salient points, as I agree with Messer Iannucci that it would have been beneficial to know that Robert Wickens was at least awake and alive in less than the 50 Odd minutes it took for this announcement. Although I understand Indy Cars reluctance to publicly announce anything until 110% certain of all "Factual" information available for Public consumption. While George Phillips of Oilpressure wrote his typically informative Post Race thoughts in the following post. Yet weirdly, the part that struck a chord with Mwah, was Geo. Phillips, Ye OLD-est IndyCar Blogger; Hya! 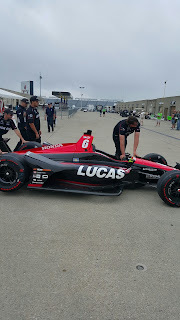 Musings upon the apparent outcry on Social Media over Michael Andretti's "Callous" comments afterwards regarding the racing incident between Wickens and his Charge Ryan Hunter-Reay. Although I've never been a Mikey A' Fan, which really Doesn't Matter, nonetheless as George rightly points out, Michael's seen, witnessed and been involved in how many On-track Crashes during his lifetime as a Driver and Team Owner, Eh? As George also points out, racing was a far more Dangerous sport during the early 1960-70's involving Driver Fatalities, which Wickens could certainly have led to, but Thankfully Didn't! Hence, this made me think about how many Open Wheel Racing Drivers have perished from racing accidents since I began following the sport in earnest mid-1986. Having not known of the late Elio de Angelis's Death in Testing NO less prior to my Formula 1 Baptism. Having brought this up simply since I cannot pontificate upon Michael Andretti's interview comments one way or the other. Except by saying, there's NO such thing as a "Safe" racecar! Alas, I'll refrain from giving a long list of Hapless racers over the past 30yrs, since Robert Wickens fortunately isn't one of them. since we all know that he's been subsequently transferred to Indianapolis's Methodist Hospital to undergo further surgery and then hopefully begin his long road to recovery, for which hopefully he'll return to racing one day? Although I must say I've got my doubts, especially if his spinal cord injury was severe, to which I don't think has ever truly been divulged? But will the Doctors inform him that another serious accident could leave him permanently Paralyzed, a la current IndyCar team owner Sam Schmidt? Whilst I think the Robert Wickens Merchandise to Support his Recovery and help Defray some of his Gynormous' Medical Bills are still available?